The Baltimore Orioles used a four-run fourth inning to help beat the Red Sox 7-4 at Fenway Park Friday night. Drew Pomeranz was roughed up for five runs (four earned) on seven hits and three walks as his record fell to 1-2. 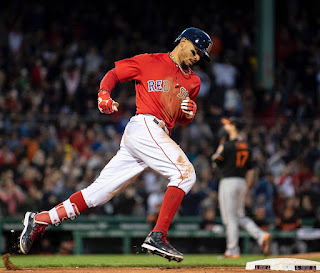 Mookie Betts (pictured) led Boston with three hits including what was at the time a game-tying home run (his 14th) in the bottom of the third inning. J.D. Martinez, Eduardo Nunez, and Christian Vazquez each had two hits in the loss. Reliever Steven Wright ate up 4.2 innings in relief, helping to save the bullpen for the remainder of the weekend series with the Orioles. Manny Machado had three hits for Baltimore including a pair of doubles.